The other day when it was uber cold outdoors I thought an antidote might be a hit of mental therapy. 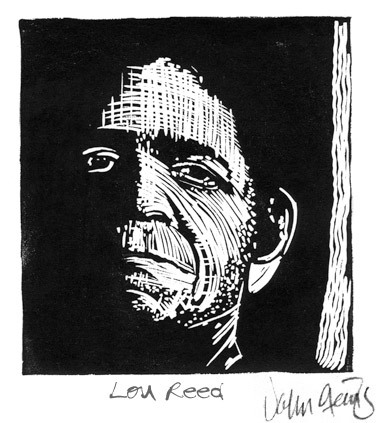 So I broke out a piece of linoleum and began a cut of Lou Reed. That “School of Hard Knocks” face and the quintessential New Yorker ‘dude seems irresistible. Thinking about him now that he’s gone I always felt that even though he couldn’t really sing his artistic integrity made up for it in spades. There is something to be learned from his amazing career. Another musician I admire is Neko Case. I’m hoping to do a colour print of her, maybe using the reduction method. Here’s more info on this print. I find this print mesmerising and powerful. I love what you can’t see. 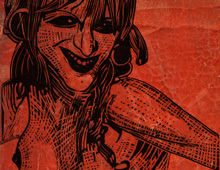 I’m speculating about making a print of another of my favorite musicians. What does Neko Case have to do with Lou Reed? Yeah I’m happy with the way this turned out. For awhile I was worried about the balance between dark and light, but it seems to work. i really like this piece and like Annmaree says its the parts you can’t see are the admiring parts. i love the cross hatching on Lou’s forehead as well. P.s. could you possibly send me some information about you and your lino printing work, i’m studying lino printing and your work for my AS art course! Thanks. Appreciate your comments and taking time to look! Just let me know what info you require and I’ll be more than happy to assist. i see why lou reed. . i see why that area on the right side but i dont like the way you did it. the face is perfect, though. stay well ! wow. This linocut you have done is very dramatic and captures the expresions on a mans face. there is so much depth. i wonder where you got either the image of this man or did you just start your work? Thanks for your comment. I used a photo as a reference to draw his image on the lino-block. One of the challenges in doing black and white work like this is to find a balance between the two. In this case I wanted to light up one side of his face and accentuate the wear and tear of all that hard living as a rock star.